Lament of Ur is an exhibition by Joey Holder and Viktor Timofeev inspired by themes of entrapment, conspiracy theories and speculation on post-human life. 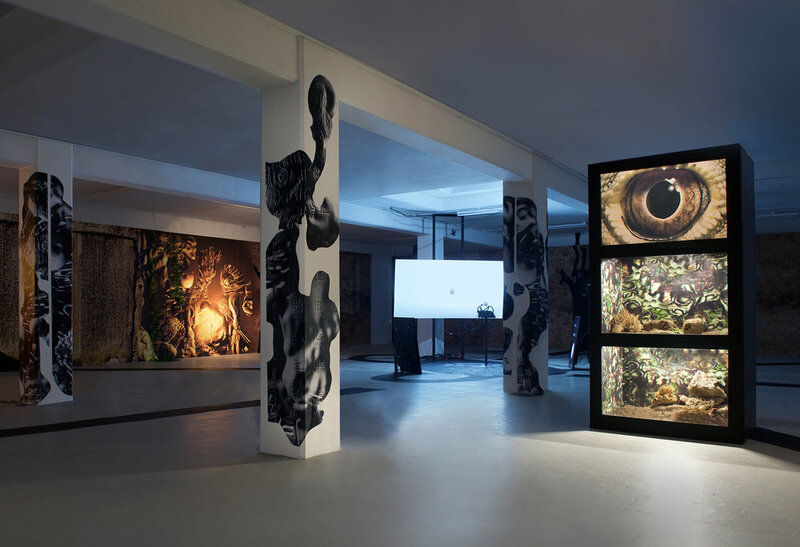 The exhibition includes a video, an interactive computer game, fabricated and found sculptures, prints and mural paintings. Holder and Timofeev’s work weaves together, eschewing the standard “duo show” division into individual practices, in favour of a synergetic in-house collaboration that brings together both artists’ works without emphasising their individual authorship, allowing the works to be re-contextualised and “ebb and flow” into one another. Environmental Metagenomics, Ecological Paralysis Self-monitoring, Self-sensing, Self-determinism, Self-defense. The complexity of their differences called to question the current assumption that they evolved from a similar point of origin. There was suspicion that something else was at work, which involved a highly specialized and self-assembled alchemy. Timescales were largely irrelevant anyway, as there was no linear travel through space around the surface of a planet; they could essentially balance on the gravitational field and ride it like a wave. The more they travelled, the more advanced they became, dynamically shape-shifting and continually self-propelling themselves through space. All that was left was a set of arithmetic patterns and traces of an ideographic language.